My latest look at guitars costing less than 500 is the Yamaha FG700S review. So what did I think of the FG700 in my latest trip to my local music store? My first impression was that it was, as Yamaha instruments typically are, a well-made but unspectacular guitar. My first impressions of the tone was the nice full volume that I could extract from the guitar. And the clarity of tone at that volume was quite impressive, especially for a guitar in this price bracket. 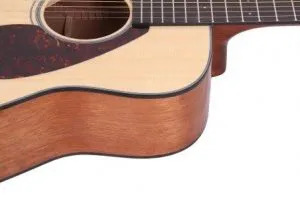 It’s a dreadnought shaped guitar which are known for good boomy volume and I felt the FG700S had this even more so than your average dreadnought. But you could also quieten it down to a whisper. So it has a good wide dynamic range. On a scale of 1-10 with 1 being very muddy and 10 being sharp and tinny, I would put the Yamaha at a 6.5 to 7 on that scale. SO quite bright and crisp but not excessively so. Top (soundboard): Solid Sitka Spruce. As standard as it comes. But it’s standard for a reason. And that Sitka Spruce is a large reason for the wide dynamic range of the FG700S. It’s also part of the reason for the bright resonant sound. Back & Sides: A laminate material called “Nato”. I’ve never seen a guitar under $500 with solid wood back and sides so I didn’t expect it here either. Tuners: Die cast chrome tuners. Sometimes guitars in this price range will save costs by having plastic tuners. Fortunately the FG700S doesn’t. Saddle and Nut: Plastic nut and saddle. A lot of cheap Yamahas (sometimes even models in the 500-1000 price bracket) have plastic nuts and saddles – a lot guitars under 500 do too. This isn’t a reason not to buy a cheap Yamaha because they have a lot of other great qualities and it won’t cost too much to upgrade them to bone or something like TUSQ. Bridge: Rosewood. 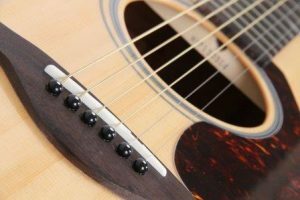 The bridge plays an important role in transferring the sound from the strings into the soundboard – one of the best materials for doing that is Rosewood. Another small key to the quality of sound for the price. 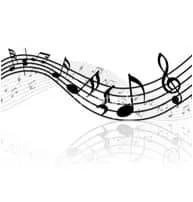 Check out the videos below to get your own idea of the sound. As is the case 95% of the time the action was too high for me. If you like a high action then it will be fine as is but if you prefer it lower, like me, then I would get it setup lowered. If you can’t do this yourself, it is usually inexpensive to have someone do it for you. The first thing I would do on this guitar, as with most, is to lower the action. But despite the higher-than-ideal action, it actually played pretty well. My hands weren’t feeling fatigued and things like sliding, bending, hammer-ons etc didn’t take too much effort. With a lowered action playing this would become reasonably fast and smooth. The fretboard is rosewood so that’s all good. And this would have been part of the reason it was nice to play. The width at the nut is 1 and 11/16 inch (43mm). This is pretty standard and should be fine for most players. Check out some of the user reviews at the links below to get an idea of what others thought of the FG700S. As you can see from the number of reviews above the FG700S is a very popular guitar! And for good reason. This is a really good option as a beginner’s guitar first and foremost. It has a balanced, even sound and is nice to play which are both very important – and it also won’t break the bank which is also important for beginners who don’t want to make too much of an investment. To make it an even better beginner’s guitar make sure you get someone to lower the action. This will make it easier and more pleasant to play. It is a full size dreadnought so perhaps not suitable for young kids. 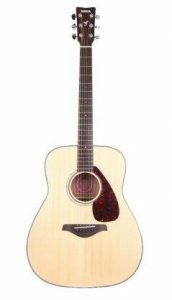 It’s also a great choice for anyone who wants a second guitar that they can take to the beach to the camp ground or anywhere when they want to leave their more expensive guitar at home. Even though this guitar is sometimes referred to as a “folk” guitar, it probably isn’t ideal for folk. It’s a dreadnought with a pretty large sound and it’s too bright for folk in my opinion with that sitka spruce top. This would be more suited to pop, rock, country, blues, bluegrass etc in my opinion. It has a list price of $325 but you’re likely to get it for under $300. For the build quality, sound and playability of this guitar you definitely get your money’s worth. It’s perhaps in the wrong category here – maybe when I make an under $300 category it will belong in there – but in terms of quality and sound it’s definitely not out of place in the under $500 category. Anyone looking for a really well priced guitar for a beginner or as a second guitar should definitely consider the Yamaha FG700S. For the money you really get value in a nice sounding, nice-to-play and well-built guitar. Thanks for reading and I hope you found this review helpful. If you have any questions or comments please feel free to leave them in the comments section below. If you’re keen to check out some other options for under 500 guitars check out the link below.